With winter now upon us and snow falling more frequently, we find ourselves having to shovel our sidewalks and driveways on a more regular basis. Snow shoveling is a repetitive activity which places excessive stress on the heart, low back and shoulders if not performed correctly. It is very important that we try to reduce the number of injuries that may occur from shoveling snow by practicing safe techniques. Wait until the afternoon to shovel: More injuries occur in the morning when disc pressures are increased and muscles are stiff. Warm up your muscles: Warm muscles work more efficiently and are less likely to be injured. Walk a few minutes or march in place and perform light stretching of the legs and arms. Pick the right shovel: Choose a shovel that is lightweight, has a smaller blade and is the proper size for your height. The shovel should have a shaft that allows you to bend your knees slightly while keeping your back straight. A shovel that is too short will require you to bend more when lifting. A shovel that is too long will make the load at the end heavier. Try pushing snow rather than lifting: If you are working in an area with enough space, push the snow off the area with the shovel rather than lifting or throwing it. Bend from your knees, keeping your back as straight as possible to make sure your are lifting with your legs. Avoid twisting by throwing snow straight ahead and pivoting your feet. Don’t over-do-it! Listen to your body. Stop immediately and seek medical help if you feel pain or experience the warning signs of a heart attack such as chest pain, neck or arm pain, shortness of breath, dizziness, nausea or breaking out into a cold sweat. If you experience soreness after shoveling, use ice. Ice is most useful for decreasing inflammation. However, if soreness remains for more than a few days think about seeing your physician or a physical therapist. 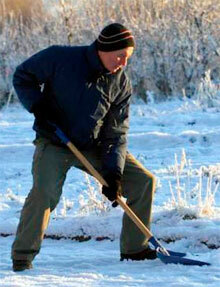 Snow shoveling may be great exercise, but it must be done correctly!